The first step in the process is finding Congressional representatives who will sponsor a Bill in the Congress for reform. We ask you to just pick up the phone and contact the following members. We have had good response from the offices of Senator Schumer and also Congressman Walsh (He always give us a reply letter — even if he does disagree). Assistant US Attorney Southwick told the Judge that his office was going to move to have the charges dismissed — but that he wanted to make some comments “for the record” first. Mr. Southwick then explained that he had done hours of investigation and research on the matter. He described John’s actions as a “protest”, that he was attempting to influence two US Senators in the building to support some legislation. The Judge appeared to follow his presentation with some interest, but before dismissing the charges asked again about the “Failure to Obey” charge and whether there had been any physical confrontation… Mr. Southwick said there was no type of violence at all, that John had cooperated with the Police Officers, but had simply refused, when ordered, to leave the building. The Judge dismissed the charges. 3/11/02 – Rich Eichinger sends a letter from the group to Senator Clinton’s office asking for some response. I am writing this letter to you to ask a very direct question. What is Senator Clinton’s position regarding Kids Rights? Is she for or against kids having equal parents in their young lives? Hillary Clinton has been a champion of Children’s issues. She is a logical person for AKidsRight.Org to ask these questions. Her role as federal legislator requires that we insist upon an answer to our questions directly from her. 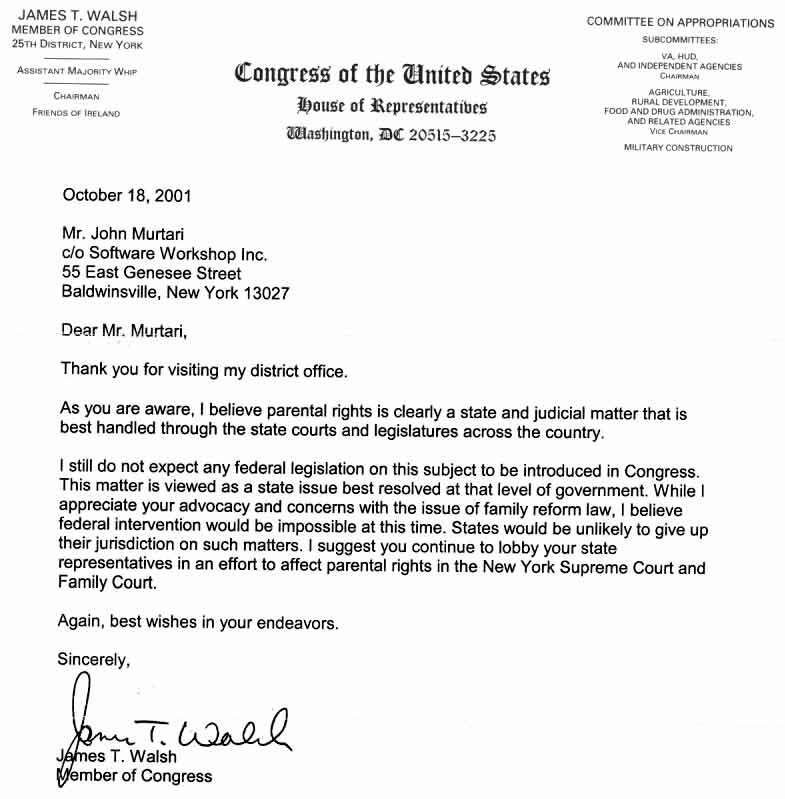 2/18/02 – John receives a letter from the Clerk of the US District Court. This date to appear for arraignment on the Federal Charge has been adjourned till March 20th. 2/13/02 – John appears in front of Syracuse City Judge Rosenthal on a pre trial motion to dismiss the charge against him of Disorderly Conduct. The Judge agrees with his attorney that the arrest report does not describe any conduct that would be justified by the charge. The charge was dismissed. 2/4/02 – John was contacted by Aprill Springfield, a legislative aid in the Washington office of Senator Clinton and requested to fax a summary of concerns. That was done and we hope for a rapid reply. A letter was also received from Congressman James Walsh of Syracuse. He continued his statements that family law is strictly a State issue and he appears unwilling to even consider that Federal protections should apply. 2/1/02 – John received two “Notices to Appear” in front of a Federal Magistrate regarding the incident January 8th. He was accused of “Disorderly Conduct” and “Failure to Obey Officer.” (Copy here) He is to appear on February 20th at 0930 AM at the Federal Courthouse in Syracuse, NY. 1/12/02 – John went to the Federal Building and was stopped by officers on the first floor. He was asked to come with them to the their office. He asked if he was under “arrest” or being charged with a crime, they said no. He politely refused to follow their instructions and said he was going upstairs to continue his efforts outside the offices of Senator Clinton. They told him that was not allowed — and without any physical contact being made they placed themselves between John and the elevators. John was finally stopped between a couple of elevators with two officers on either side. It was a “standoff”, they would not initiate any arrest action and John was ready to wait for a couple of hours. There was no hostility, the officers and John knew each other from other encounters and everyone was doing their “duty.” It appears that the Senators staff was aware of what was happening in the Building Lobby. After about an hour Cathy Calhoun, the Regional Representative for Senator Clinton came down to talk to John (they had met during an earlier meeting last Spring) and after some conversation told John she would give him the name of a Legislative Aid from their Washington office who would be able to follow up with him on the issue of reform. This was certainly good news and John left the building. Efforts will now be focused on the legislative process (expect more details soon). Next Monday, Jan 21st, is Martin Luther King day. The Federal Building is closed on that day. We hope to encourage as many people as possible to make a trip to Syracuse on the day after, Tuesday, Jan 22nd. Hopefully our actions will show some important US Senators that Family Law reform is a serious issue. Personally present your “story” and the pain you and your family has been through to their staff members and also watch NonViolent Action in action. Contact John Murtari (jmurtari@AKidsRight.Org), if you might come that day. 1/16/02 – John returned to the building and went to the 13th floor (Congressman Walsh). He walked for a few minutes and was then stopped by a Federal Police Officer who told him to stop his action or more tickets would be issued. John said he would not, and he was ordered to follow him to the downstairs office (the rest is in John’s word)… (A Letter was sent to official regarding the incident the next day). After we got down to the office I was normally used to the routine of being searched and being told to sit for a while until the Syracuse PD showed up. Today, I sat down and after a bit of a phone conference I was told I was free to leave the building, but could not go upstairs. I told them I did not want to leave the building. They said “okay” and I continued to wait. After about an hour I realized something was different. I finally asked the officer what they planned on doing — he said nothing right now, you can leave anytime. At that point I figured they might just wait till 5pm when the building closed, then ask me out and lock the door…. This was something new and I decided to leave on time to catch a bus to the office. It appears they are willing to just wait me out…. 1/14/02 – John returned to the building, went to the 8th floor (Senator Schumer) and was able to walk for two hours without any problems. He plans on returning on Wednesday at 2pm, and walking on the 13th floor (Congressman Walsh). A brief News Release was sent out earlier in the morning to local media. 1/11/02 – A preliminary hearing was held with Judge Rosenthal. It came as quite a surprise to find the Arrest Report (see copy here), describing John’s behavior as “threatening & tumultuous.” A motion date has been set for February 6th at 2pm. My attorney had let me know about this earlier and I did give both the Judge and DA a letter which explained what really happened and why. Because what the Police said is so imaginary, and there were so many witnesses (and probably building surveillance tapes) to my quiet conduct — there may be a good chance of pursuing a case of “malicous prosecution”. But that is really a side issue. What’s more important is — it really didn’t bother me or frighten me that much to see such exaggeration and fabrication. If you read the letter, I think the officer just put all that down because after the arrest they realized they didn’t have enough real facts for “Disorderly Conduct.” After all, they had a good goal, they just wanted to stop me from going back to the building and after the charges which were dismissed earlier in the week — just trespass wouldn’t do it. It really brought back memories from my Divorce, and I’m sure many of you can relate to reading similar words — or perhaps even using similar words to describe your “tumultuous” former spouse…. Unlike with our children, there is not a lot at stake here. But I still get a presumption of innocence and a burden of proof “beyond a reasonable doubt,” and legal representation if I can’t afford it. If there was serious jail time I would also get the protection of a Jury. So, not too much to worry about. But in “Family Court” — it would be a whole different story. No one is every really required to “prove” anything and you don’t get many protections at all — what a difference! NOTE – Please don’t confuse this with me saying what the Police did as okay. It was not and they should be punished for it. 1/8/02 – John was involved in a rather complicated arrest today, Jan. 8th at the Federal Building. Two Federal Police officers watched him quietly carry his sign with children’s pictures and then arrested him for loitering and causing a disturbance. These were Federal charges. The City Police were then called and after approximately one hour of discussion, they arrested John for disorderly conduct for refusing to leave the building . He was arraigned on Wednesday, Jan 9th, by Judge Rosenthal and released with orders not to return (Order of Protection) to the Federal Building unless for “legitimate business”. A preliminary hearing was scheduled for Friday, Jan 11th at 2pm. 1/7/02 – In a Court appearance City Judge Higgins dismissed the three trespass charges against John as simply being defective (as were the other 20 charges dismissed earlier by the same Judge). John has been quite fortunate to have an assigned counsel (Mr. Charles Keller, Criminal Division Chief of the Hiscock Legal Aid Society) who has vigorously defended his Constitutional right to petition his Members of Congress by walking peacefully in the building. “Senator Schumer and Senator Clinton, after initial meetings with staff last spring — we have had no follow up dialog. It seems almost unbelievable that we have not even received a written reply after several letters and petitions were sent to both your local and Washington offices. It may be that each of you is not even personally aware of what is happening? Do loving parents need to risk jail to focus the attention of our elected representatives? …We can only ask each of you to consider stepping forward, being “proactive” and taking a leadership role in calling for Congressional hearings into the need for Civil Rights protection for families. Many of us, including myself, never gave the patchwork of well meant “family/child” legislation a second thought — until being caught in the system ourselves, along with our children? We certainly can’t expect you to immediately call for such hearings. Instead of jail, all of us would much rather work on dialog with your staff so we can both better understand the nature of the problem. Allow us to help in collecting witnesses and evidence of a system gone terribly wrong. At the end we expect to not only hear your decision about the need for Congressional hearings, but also the rationale. Does the parent/child bond require Federal Civil Rights protection? … Please, this is an urgent matter and a year has almost elapsed. I noted with some irony a recent article in USA Today, about Members of Congress calling for hearings to discuss the nature of military tribunals to be used in the War on Terrorism. They wanted to apply our Constitution’s greatest civil protections — the standards of “proof beyond reasonable doubt” and “unanimous verdict of a jury” to these actions. If there is time for that — don’t the parents and children of this country deserve a discussion of those very same protections before being separated for potentially a life time?…” Read more here. 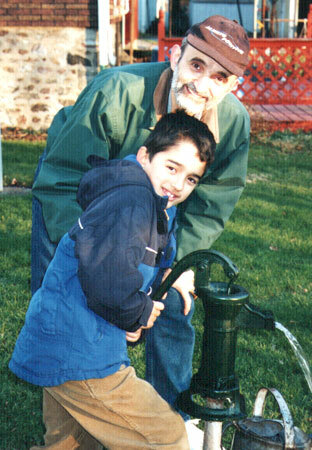 12/25/01 – “Had just a wonderful Christmas with my Son Domenic. Compared to what so many of you had to deal with … through all this our love for each other has remained strong. It is a great gift.” — John Murtari. (click on the picture for a larger image). You can click here for a family Christmas letter with more photos. 11/19/01 – John again returned to the Federal Building and was able to walk on the 8th floor for two hours with no arrest. It now appears that authorities may just allow this to continue. John will be taking a break with Christmas approaching (he and his Son should have 10 days together and both are looking forward to the time). “Many of you know I am presently involved in an ‘experiment’ in NonViolent Action. Our list talks about it a lot and we have a lot of historical information about it at the web site. But as most of us know, theory is one thing — practice is quite another. Many of you are wondering and skeptical. Are Faith, Love, and personal Sacrifice enough to bring dramatic social change? Is a willingness to spend a night, a week, or a year in jail really going to make any difference? Isn’t this all a little bit naive and simplistic? I have shared those same thoughts and need your advice on what is next…” Read more here…. 11/13/01 – John returned to the Federal Building, started to walk on the 13th floor (outside the offices of Congressman Walsh) and was arrested. He was arraigned the next day for simple trespass and again released. He plans on returning to the building again on Monday, Nov, 19th. “I wanted to share an update on events at the Syracuse Federal Building and also make a request for help. This may sound surprising, but I have had about 6-8 different people express an interest in joining me and undergoing arrest, spending a night in jail. So far, I have managed to talk every one of them out of it…” Read more here…..
10/29/01 – John returned to the building and was allowed to go to the 8th floor, offices of Senator Charles Schumer. He was able to spend about 90 minutes quietly walking the halls and carrying his pictures of parents and children (above). There was no arrest. 10/22/01 – John returned to the 13th floor of the Federal Building and was arrested for trespass. He was arraigned on trespass charges and released. He was ordered to stay away from the building except for official business. We also received a reply letter from Congressman James Walsh (the first to reply). 10/16/01 – John was arraigned in front of Syracuse City Court Judge Higgins (who was the same Judge which dismissed the earlier charges). He was released. He plan’s on returning to the Federal Building on Monday, Oct. 22 at app. 2 PM and will send a letter to alert the Building Manager. John welcome’s anyone who wishes to visit Syracuse on this Monday or any other. He would be happy to meet with you prior to the “event.” Just contact him directly. 10/15/01 – Yvonne Cook, Richard Eichinger & John Murtari go to the Federal Building to present petitions and an important cover letter to Senators Schumer and Clinton, and Representative Walsh. They are met by a Federal police officer inside the building. He tells them they are welcome to visit the offices of Senator Schumer & Representative Walsh, but the staff of Senator Clinton had expressed some “fear about their visit”. Senator Clinton’s staff also expressed they did not want to hear anything more about the issue. So all three of them proceeded to the offices of Senator Schumer & Representative Walsh to deliver the information and it was accepted with no problems. John then took a small placard containing pictures of several parents and children and was ready to quietly walk around one of the floors as he had done in the past. He was told not to do this and it eventually resulted in his arrest for trespass. Yvonne & Richard left the building without any problem and during the entire time both the Federal and City Police treated everyone very fairly. 10/12/01 – We send a new’s release out to both national and local media lists. We are contacted by a local TV affiliate asking for the exact time we will be at the Federal Building. 10/10/01 – A final mailing list message is sent. We receive a call from a local aid of Senator Schumer (D-NY). They had received a copy of the letter sent to the Building Manager and we had a nice conversation, about 30 minutes. We both agreed that the reason no action is being taken on this issue is just “priority.” They have a limited amount of legislative staff and unfortunately it just isn’t seen as an important issue that a lot of people have expressed interest in. THIS IS OUR JOB. 10/2/01 – We send a letter to the Federal Building Manager alerting them we will be in the building on Monday in a very peaceful activity. We also send copies to the three members of Congress (above). REMEMBER – Again, we are trying to keep a positive and courteous attitude at all times. These are good people that we are dealing with (certainly no worse than any of us are!). They may have trouble understanding our situations and goals. We will help them understand, NOT by insults, but by demonstrating OUR willingness to sacrifice for the sake of our children.